Brightness: 12000lm. Do not irradiate the eyes directly, as the brightness light will harm the eyes. One Button Switch (4 Modes): 1 x CREE XM-L T6 / 2 x CREE XM-L T6 / 3 x CREE XM-L T6 / Flashing. LED Model: CREE XM-L T6 LED. Guide your way in the darkness and early morning. A friendly accessory for camping and hiking. 4 modes of operation: 1 LED mode, 7 LED mode, 12 LED mode and flashing mode. Ultra-bright 12 LED lights. Type:Head Torch / Headlamp. Lighting Mode：Weak light, Glare, Strobe. - Reflector flat lense gives you high definition coverage. - Adjustable beam angle, point it straight ahead or on the floor - multi-point angles. Powerful 9900mah Batteries!BUY 1, GET 1 AT 10% OFF ! 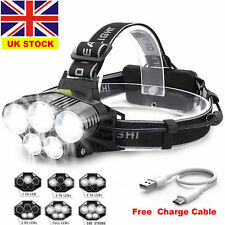 Ultra Bright, High Intensity Long-range LED Bulbs Light Long Shot Headlamp 14 High Intensity LED Bulbs Extensive lifetime of LED (100,000 hrs) Adjustable head strap keeps lamp from bouncing around Adjustable Inclination Takes 3 (Three) 1.5 V (AA Size Batteries) Not Included Great for camping, hiking, hunting, fishing, survival kits, emergency lighting, home use both indoor and outdoor. 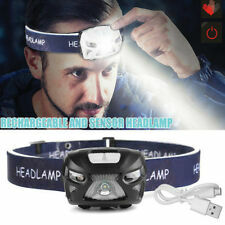 One LED Headlamp/headlight brand new in package as shown in photos. Tactical Zoomable 20000LM 3-Modes T6 LED 18650 Police Flashlight Torch Lamp. Tactical 20000LM 3Mode T6 LED 18650 Military Flashlight Zoomable Flashlamp Torch. Ultrafire Zoomable Tactical 50000LM LED T6 LED Flashlight 18650 Torch Light Lamp. Do not irradiate the eyes directly, as the brightness light will harm the eyes. One Button Switch (4 Modes): 1 x CREE XM-L T6 / 2 x CREE XM-L T6 / 3 x CREE XM-L T6 / Flashing. 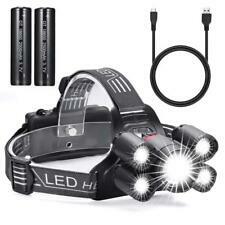 3 x CREE XM-L T6 LED Headlamp with 4 Modes. Brightness: 12000lm. Do not irradiate the eyes directly, as the brightness light will harm the eyes. One Button Switch (4 Modes): 1 x XM-L T6 / 2 xXM-L T6 / 3 x XM-L T6 / Flashing. 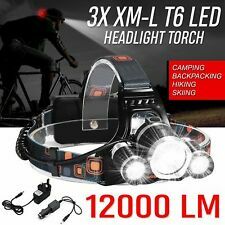 3 x XM-L T6 LED Headlamp with 4 Modes. 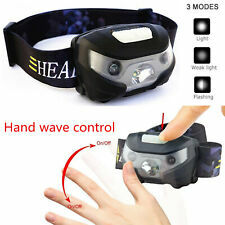 19 LED Head Torch Perfect for camping / hiking / walking etc... ! NOTE: OUR TORCH HAS 19 LEDS (NOT 12) AND INCLUDES 4 MODES Limited Stock Available WE ARE A GENUINE UK VAT REGISTERED COMPANY Description: - Ultra-bright 19 LED lights - High Intensity LED - Durable and low power consumption - Adjustable Strap - Adjustable Inclination - 4 modes of operation: 1 LED mode, 7 LED mode, 19 LED mode and flashing mode - Powered by three pieces of the 1.5V AAA Size battery (Batteries not included) - Suitable for home, outdoor, fishing and spare lighting on your car - Guide your way in the darkness and early morning .A friendly accessory for camping and hiking. Mixed lot of camping lights. I set of illuminated bunting lights for around tent. 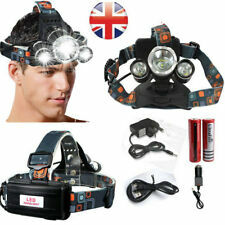 2x good quality head torches adjustable. Internal wiring applies the high efficient booster circuit, results can utilize the batteries efficiently Adjustable base is provided for each head lamp, with back and forth inclination up to 90-degree angle 3X Cree XM-L L2/T6 Headlamp Model of LED: 3x XM-L T6 / L2 CREE LED Output bright can come to max 8000 lumens [lm] One button switch : 1x XM-L LED/ 2x XM-l LED/ 3x XM-L LED/Flashing Model of Battery required: 2 x 18650 3. 1 x Boxed head torch. Condition is Used. Uses 3 aaa batteries (not included). Over 10 years experience in conversion rate optimisation. Product Description Powerful LED Head Torch ---LED Model: CREE XM-L T6 LED ---Powered By: 2x 18650 3.7V High Capacity Rechargeable Batteries(Not included) ---Batteries and recharging cable included ---Brightness: 6000lm ---90° Adjustable Headlight ---One button switch design, with 4 adjustable modes ---Modes of 1, 2 or 3 lights on, plus 3 light strobe --- rechargeable USB CABLE INCLUDED. Neolight LED head torch. Not only is it ultra-bright, but it's a comfortable, easy-to-wear design. ★ WATERPROOF & ADJUSTABLE - Our head lamp is IPX5 Waterproof standard that gives protection against splashing water from all angles, making it ideal for use when raining. Clean things up or go for a walk?. 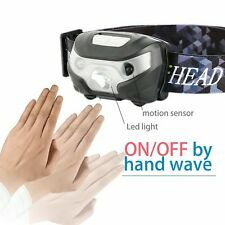 Lightweight,Adjustable and Portable: This headlamp is only about 75 grams with 3 pieces of Duracell AAA batteries included, comfortable to wear and Adjustable headband,CREE XPE LED technology,Portable sleek design,Brightest spotlight beam.